When less grass is available, some horses struggle to maintain weight, which means they need their energy intake from forage and supplementary feed increased. Forage assessment is the first step, followed by adding concentrate feed and, if required, vegetable oil or oil-rich supplements. Weight gain or an increase in condition requires an increase in dietary energy (calorie) intake, over and above the extra energy required for work. The first most important factor for weight gain is to feed ad lib forage of a good energy level. Ad lib means there is always some in front of the horse when he’s not being exercised. During winter when grass availability reduces because pasture is eaten down and not regrowing due to cold temperatures, conserved forage such as hay or haylage should be fed out in the pasture when the horse is turned out. Feeding forage in the pasture during winter is a key factor in maintaining good condition. Ensure the forage is of a good energy level and ideally over 9 MJ digestible energy (DE) per kilo. Early cut meadow or ryegrass hay or haylage would tend to be higher in energy than later cut forages, but ideally have it analysed to check. Feed companies can help, or it can be sent direct to a laboratory such as Equi-Analytical (www.equi-analytical.com). The difference that high-calorie forage can make to weight maintenance is clear when you look at the numbers. Consider hay with a DE of 8 MJ/kg versus hay with a DE of 9.5 MJ, for a 16.2hh horse weighing 560 kg and eating 12 kg hay per 24 hours. The difference in energy intake is 18 MJ, which is the same as supplied by one and half (Stubbs) scoops of conditioning mix. You can feed more than one type of forage overnight, and doing so may encourage your horse to eat more. Researchers found that when horses have a choice of forage in stables, they browse more. Offer some haylage as well as good hay, and perhaps a large tub of dampened grass or alfalfa chaff or soaked grass or alfalfa nuts. Once the horse is fed ad lib high-calorie forage, then add concentrate feed as recommended on the feed sack. The latest high digestible fibre, low starch compounds are the most useful since they are safer (in terms of gut health and risk of excess excitability) to feed in larger quantities than traditional, starch-rich conditioning feeds. The general guide is to feed a maximum of 1.5 kg of a concentrate feed per meal, but ideally stick to a maximum of 1 g starch per kilo of bodyweight per meal, calculating the relevant amount from the starch content of your chosen concentrate. 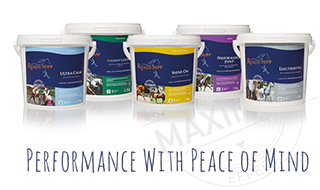 If your horse requires large amounts of compound, you will need to feed three or perhaps even four meals daily. These don’t need to be equidistant in time and a third meal can be added for a stabled horse a couple of hours after the late afternoon/early evening meal. For horses fed ad lib good forage and the full recommended amount of concentrate feed, further calories can be added in the form of vegetable oil or an oil-rich supplement. The best oil for horses is linseed, but rapeseed can also be fed. These are richest in omega-3 fatty acids, which have health benefits over and above supplying calories. Horses can digest a much larger quantity of oil than their natural forage diet supplies, but it does need to be increased gradually and different horses will have different thresholds for the maximum they can digest. A general guide is 300 ml maximum for a 500 kg horse, but some will take up to 1 litre daily. Check vitamin E intake when you feed supplementary oil since requirements are increased a little. If the total intake of vitamin E is under 1000 IU daily (check your compound feed), you need to add extra vitamin E.
Oil-rich supplements are available in the form of straights – ready cooked whole micronized linseed, coconut (copra) meal, soya flakes or ricebran or compounds made by feed companies. If you feed more than 500 g of linseed, ricebran or copra meal daily you need to add calcium carbonate (limestone flour) to balance the calcium to phosphorus ratio. Add 15 g limestone flour for every 1 kg of oil-rich straight.